To be honest, I almost wanted to give up baking it – I’ve tried it twice and both times the bread was just too hard and dry and I was already late for the submission. But you know how sometimes, the more we failed at something, the more we will try it to get it right? And finally, the 3rd and 4th tries were successes! Okay not say a 100% success, but 70%? The bread was soft and fluffy, and the chocolate swirls were absolutely delicious. I just wished that it would be even more softer – maybe I should try it out with bread flour / knead more etc… but overall I’m really glad that the bake turned out to be pretty darn good! When I took photo of this bread, I’ve already eaten two of them! 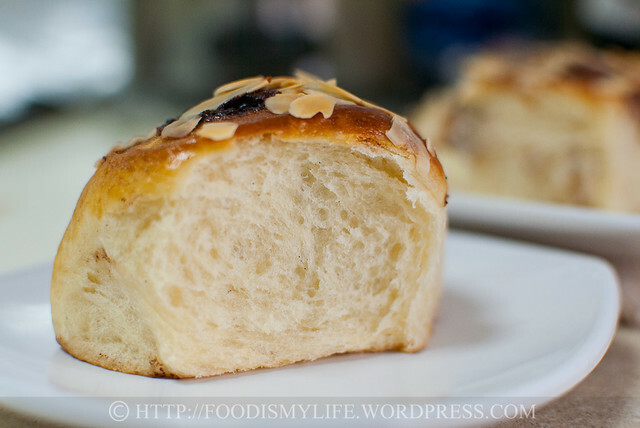 Warm bread is so soft and fluffy and yummy! When I first saw the name of this bake, it wasn’t bread as stated in my title, but it’s actually a cake, and after reading the recipe and trying out the recipe, I feel that this is definitely not a cake but a bread. I wonder why the author called it a cake? Anyway, putting the name issue aside, after failing the first try, I felt that the method of baking this bread to be too complicated and troublesome. So far whenever I see people baking bread, it’s just about mixing, kneading, rising, kneading and shaping. I went around researching and decided to change the steps, I hope this will encourage more people to bake this and delicious bread! 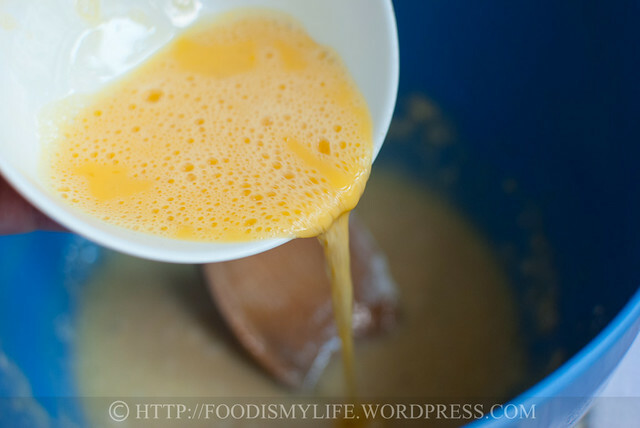 Instead of creaming the butter, sugar and egg, I chose to dissolve them (except the egg) into milk and mix the egg and flour in. Instead of shaping the dough as stated in the recipe (which I couldn’t really understand), I simply rolled it out into a large rectangle, sprinkle the filling, roll it up then cut into rolls. I also baked them in a tin with them arranged together. I changed the streusel filling into a simple sugar-cocoa powder-cinnamon mix. I brushed the rolled-out dough with melted butter before sprinkling the filling so that it will stick. This bread is best served on that day it’s bake. It was a little hard on the outside but still soft on the inside after 1 day. After 2 days, it had become a little too tough for my liking, so I’m looking for another way to make a much softer bread with a longer shelf-life. After this bake, I realized bread-baking is very interesting and pretty fun. This is my first attempt in bread-baking and I’m sure there would be many more to come! Start off with milk, water, butter, sugar and salt in small pot. Bring it to a simmer – making sure the sugar and salt has dissolved and the butter has melted – then transfer it to a large mixing bowl. Let the mixture cool slightly (I take this time to wash the pot – by then the mixture should have cooled till very warm but not hot). Add in vanilla extract/paste. 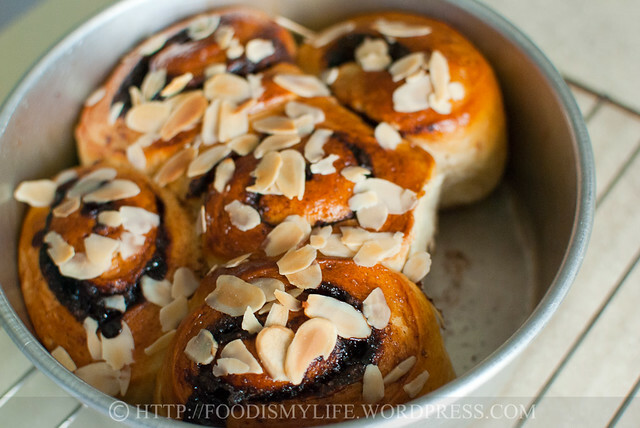 I’m using vanilla paste here – it gives the bread very beautiful specks of vanilla seeds. 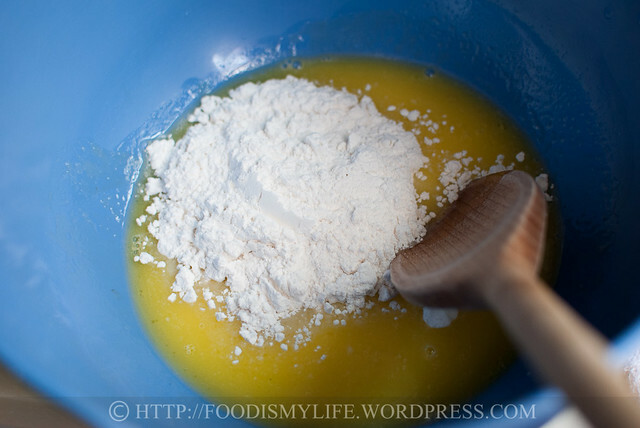 Stir in some flour – the colour will lighten to a pale beige colour. 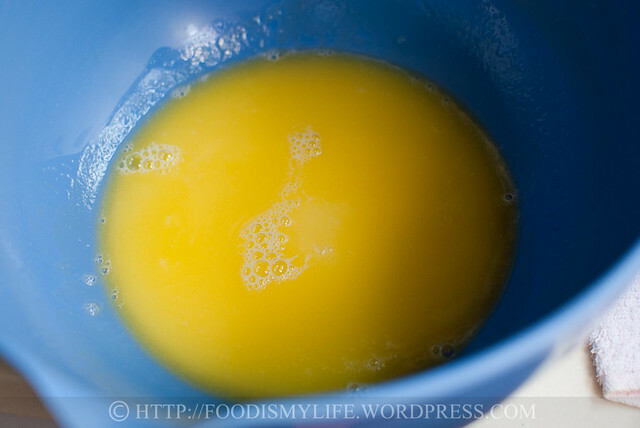 Stir in 3/4 of a beaten egg. The remaining 1/4 egg is used as an egg wash later on. Active dried yeast – this type of yeast, as its name suggests, requires activation. If you’re using this kind of yeast, add the yeast into the some warm water and sugar and let stand for 10 minutes till foamy. Heat the milk and salt together (omit the water and sugar that you used to activate the yeast), add in the flour, egg and then the yeast mixture. Instant dried yeast – this type of yeast does not require any activation. It is often added in together with flour, hence I’m adding it together with my second addition of flour when the mixture is still warm. Add in more flour, mixing thoroughly after each addition until you get a soft dough and that it doesn’t stick to the wooden spoon anymore. Next your turn it out and knead until it’s soft and elastic. After kneading, you’ll want to let it proof in a very warm place. It’s ready once it’s been proofed double its size! Takes about 1 hour to 1 1/2 hour. 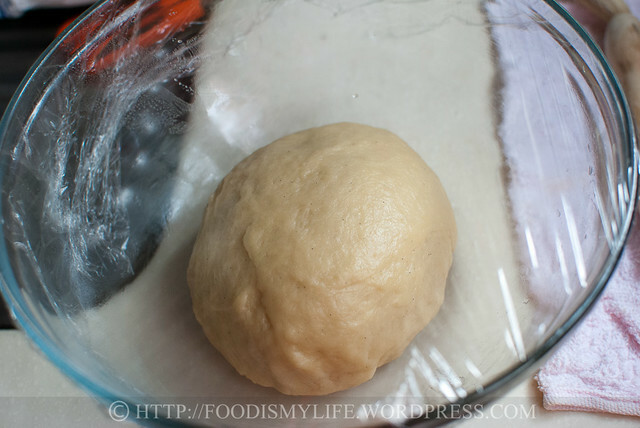 Take out the dough, knead till smooth and roll it into a large rectangle. 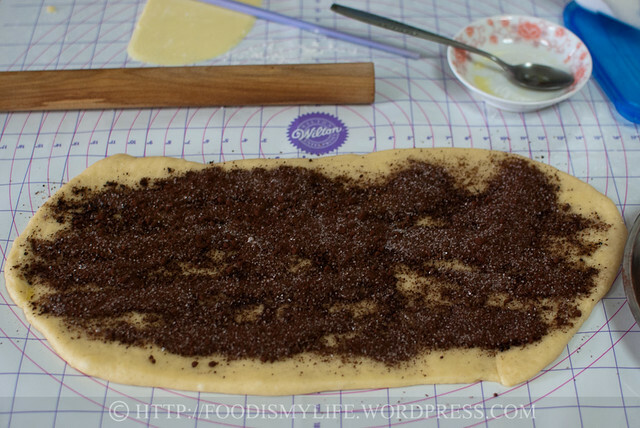 Brush melted butter all over the dough then sprinkle a sugar-cocoa-cinnamon mix evenly on the dough. Roll it up and cut them into 1-inch / 1 1/4-inch thick rolls. Cover and let proof till double in size again, about 30 to 45 minutes. Bake for 18 – 20 minutes till golden brown. Serve warm! The Home Bakers #10 – the original recipe can be found here, baked by lovely Anuja from Simple Baking. Check out all other members’ bakes here! Twelve Loaves hosted by Cake Duchess, Creative Culinary and Lifesafeast. Epicurious – I found the videos on kneading, first rise and second rise very useful. How to Make Homemade Bread by riboflavinjoe – a very simple video that teaches how to make basic bread, but I learned the method of proofing from here. How to Make Bread from Scratch by TheCraftyGemini – a great video with lots of useful information on bread-baking. Preheat the oven to 100 degrees Celsius and boil a kettle of water. Lightly oil/butter a large heatproof bowl (to be used for proofing the dough later) and a 7-inch or 9-inch baking tin. 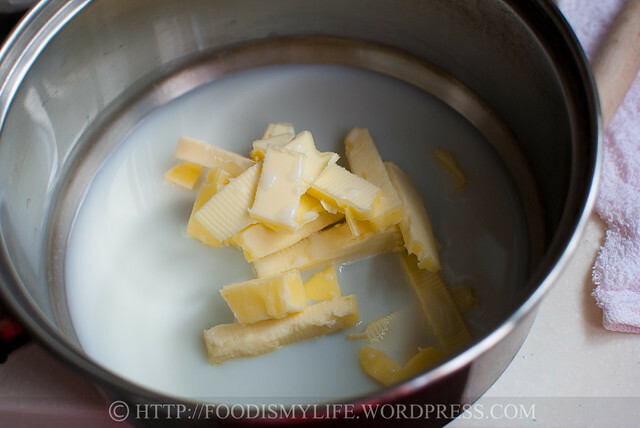 Combine the milk, water, butter, sugar and salt in a small pot. Bring to a simmer. Transfer to a large mixing bowl and let it cool till very warm but not hot. 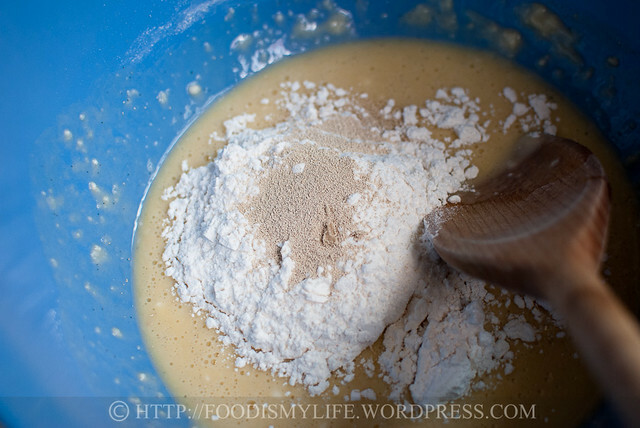 Add in vanilla extract and 1/2 cup of flour and mix with a wooden spoon till the flour has been fully incorporated. The mixture will turn into a pale beige colour. Add in the beaten egg and mix well with the wooden spoon. 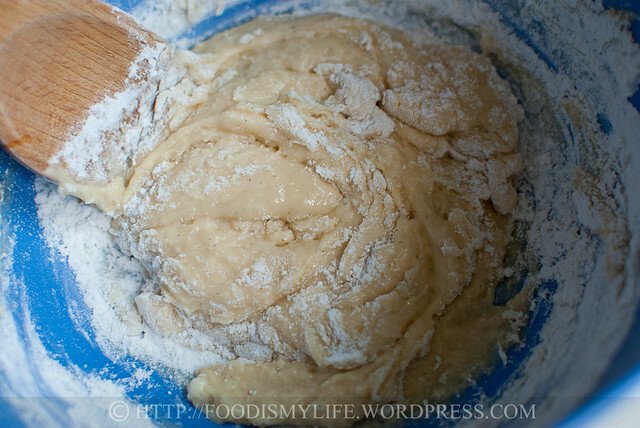 Add in another 1/2 cup of flour and the yeast and mix well. The mixture should now become more sticky. 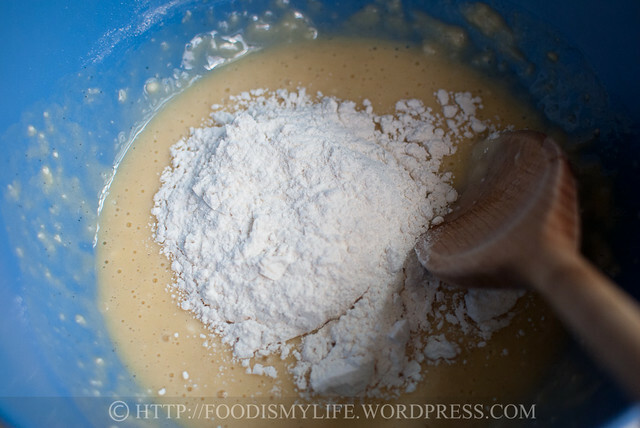 Add in more flour, in 1/4 cup increments, mixing well after each addition. 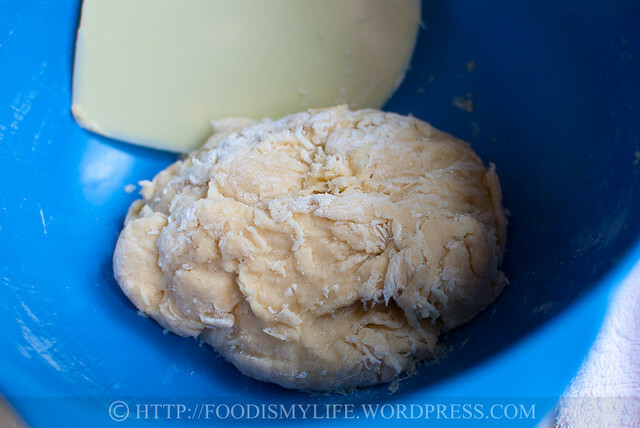 Stop adding when the dough forms a soft dough and no longer sticks to the wooden spoon. Once the dough is smooth and elastic, shape it into a round oval with a smooth surface at the top. 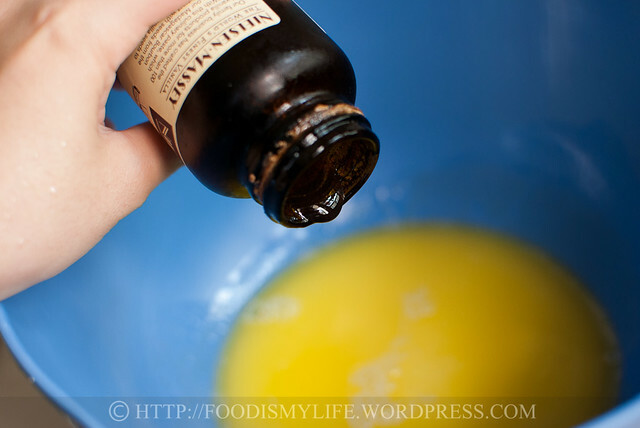 Place it in the greased heatproof bowl and brush the top lightly with more oil/melted butter. Cover the bowl with a tea-towel. Turn off the oven and place the bowl of dough inside the warm oven. Pour 2 large cups of boiling water and put them in the oven on both sides of the bowl of dough. 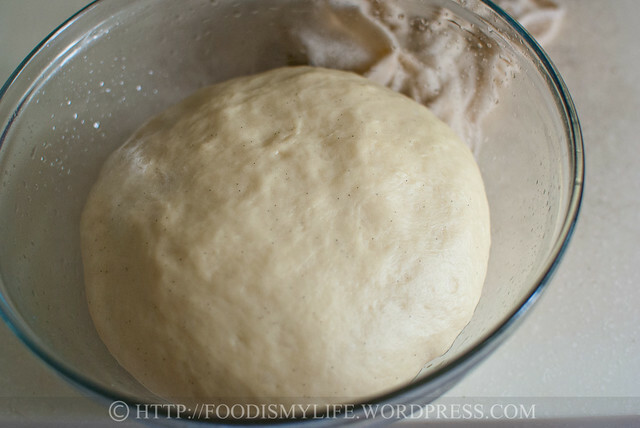 The water will help keep the dough moist. Shut the oven door and let the dough rise for 1h to 1 1/2 hour, till the dough has double in size. While the dough is proofing, combine the filling ingredients – sugar, cocoa and cinnamon in a small bowl. Once the dough has doubled in size, remove from the oven. Turn on the oven and preheat at 100 degrees Celsius. Punch the dough down gently – you’ll hear a soft hissing sound – to release some of the air. Turn the dough out onto a lightly floured surface and knead till smooth, about 30 seconds to 1 minute. 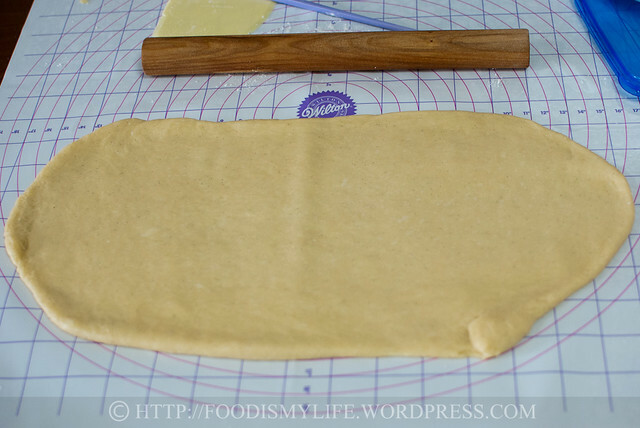 Roll the dough out into a rectangle – about 1/4 inch thick, so that you will get a beautiful swirl. The dough will keep shrinking back, but just keep rolling! 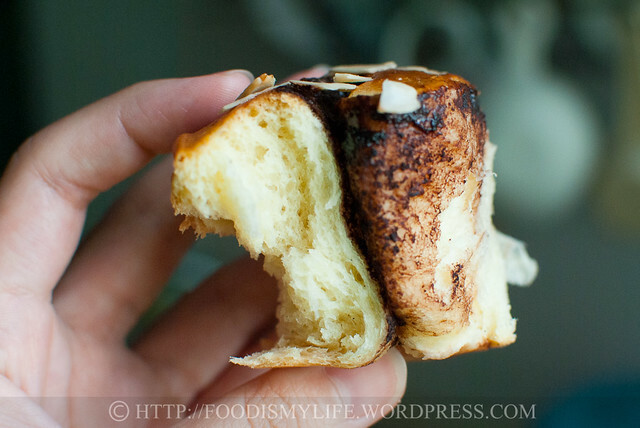 Pour the melted butter all over the dough and spread it around with your fingers or the back of a spoon. 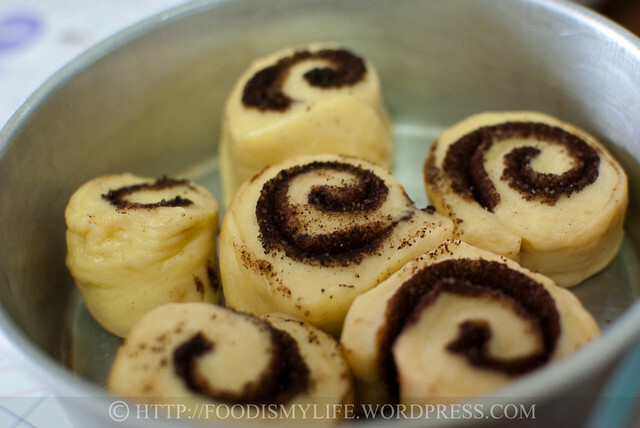 Sprinkle the chocolate filling evenly and roll the dough up, tucking it tightly. (I like to roll up from the short side so that I get a nice big swirl, but if you like smaller rolls, roll up from the long side.) Cut the dough into 1-inch or 1 1/4-inch thick slices and arrange them, cut side up, on the grease baking tin. Cover the tin with a kitchen towel. Turn off the oven and place the baking tin in the warm oven with another 2 cups of boiling water. Let the dough rise double its size, another 45 minutes. Remove from the oven. Preheat the oven to 175 degrees Celsius. 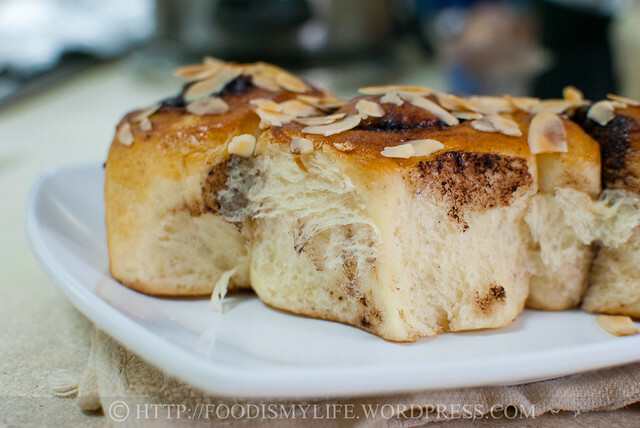 Brush the bread with the 1/4 beaten egg and sprinkle the almond flakes all over. Bake for 18 to 20 minutes until the top is lightly golden. Let cool on a wire rack. The bread is best serve fresh and warm from the oven, but it can be stored in an airtight container for 1 to 2 days. Thank you Sibella, do make them, it’s really delicious and I’m sure you’d be able to bake them better than me! Ahh thank you Amy! Will definitely try it out the next time, thanks! Great job Jasline!! And yeah I agree with you!! The more we can’t get something right, the harder we try at it!! 🙂 Very nice and fluffy! Yum! I think sometimes the texture also has got to do with the proofing temperature. I find that certain dough proof better at higher temperatures! (approx 200F) Whereas puff pastries proof better at lower temperatures (150F) hehe.. Anyway, beautiful bread. I’m sure it tastes awesome too!! you must be so frustrated with the earlier ones that you made and am glad that you finally made it successfully! thought you’re not baking this..hehe..mine turned out a little dry, suspected i overbaked it. i didnt know that it’s your first time making bread, well after this try, i think you will be making more breads in the future, right? Jasline, this bread looks amazing! You did such a great, great job! I will save the recipe so I can make it sometime. They look amazing. My dad adds a little extra fat to his loaves to make them softer, don’t know if that would help. Feet? I’ve a lot to learn about macarons.. I’ve never made them! Thank you Joyce! I always see you baking lots of bread, hope I’ll be able to do that too in the future 🙂 I think I’ll give bread flour a try the next time. Can’t wait for the next bake! Thank you very much Anneke! Thank you so much for the tips Amy!! I will definitely try the freezing method – if it works I’ll be able to have freshly baked loaf everyday! 🙂 I would like to ask at what temperature do you defrost them at? The temperature used for baking the bread? Thank you for the compliments Bobbi! Wow 5 nights in a row? That’s a lot of mangoes, rice and coconut milk I believe! But I’m glad you got the perfect results, the feeling must had been very satisfying! Thank you Jeannie! Yes home-made bread smells really wonderful! You made them into lovely buns! I use bread flour even though the original is AP flour, as our AP flour is not as strong as theirs. These are indeed delicious especially when eaten warm! I’m glad that your had success with your bread making, now looking forward to more breads from you! Have a wonderful week! As for shelf life, most homemade breads tend to go stale quite quickly because they don’t have preservatives in them. If you freeze the bread when it is freshly baked, and then defrost in the oven it will be just like it’s fresh. Small buns usually only take about 10 minutes in the oven to defrost. I’ve had quite a bit of success doing this with both sweet and savoury breads, just wrap them in plastic wrap and put in a zip lock bag. Good luck with your bread baking endeavours! L.I.K.E. your take on this month’s bake at THB’s! 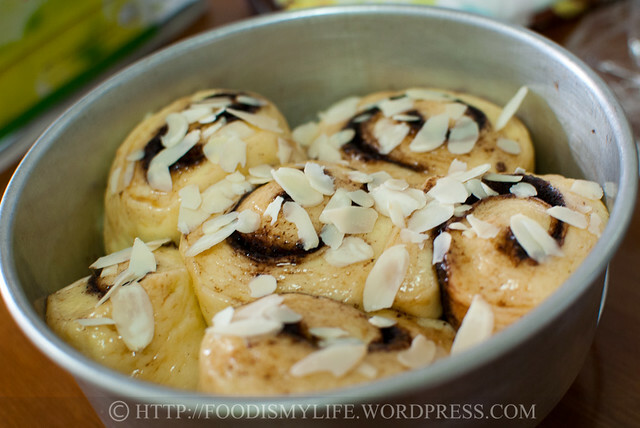 It looks beautifully done and I like the fact you made rolls out of the dough! You’ve made this into cinnamon rolls! Looks delicious and bet they smelt good during baking huh! They look really delicious, I think you did wonderfully. The rolls look perfect to me. I bet these would taste wonderful for breakfast on a cold morning! I love this type of coffee cake/sweet bread recipe and find it very easy to create successfully in contrast to macarons which failed miserably the first time I tried to make them, discouraging me enough, in fact, that I never attempted to repeat the experience. 🙂 I especially like the chocolat-almond variation as, to date, cinammon/ground nut or raisins are my usual fillings. Sometimes ground poppyseeds cooked in milk and sugar if I’m feeling nostalgic for my mom’s old recipes. I agree that the buns don’t keep well til the next day though I’ve found that a short low blast in the microwave does help return some of the soft/tender texture. Thanks for sharing my Espresso Chocolate Chip Bread! Love your blog, I’ll be following along now. And I agree with Villy, wish I had a piece right now!